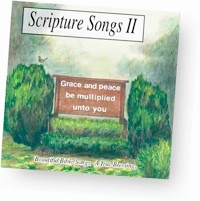 This music is the combination of many experiences and talents; and like "Scripture Songs I" it draws exclusively from the Word of God. The Bible commends us to hear the Word of the Lord, to drink fully from it's fountain. It has been our privilege to gather scripture in melodies that proclaim God's promises to his children. We encourage you to place these promises into your mind, embrace them in your heart, and experience them in your life.